Product #17184 | SKU 8-144-0001 | 0.0 (no ratings yet) Thanks for your rating! The retroFlex Rig Bundle for Blackmagic Pocket Camera from Redrock Micro is a modular cage support system designed to mimic a retro shooting style reminiscent of older 16 mm Bolex or Super8 cameras. The rig consists of a pistol grip with start/stop trigger button, a 3x optical viewfinder, and a protective cage - all designed specifically for the Blackmagic Pocket Cinema Camera. 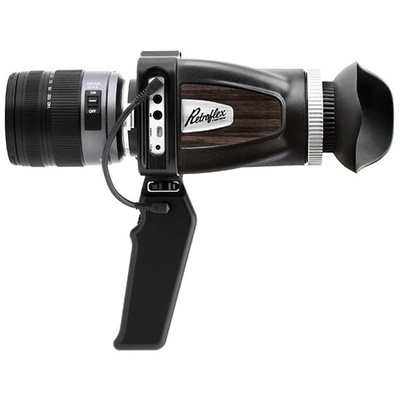 The compact size makes the rig suitable for a wide range of run-and-gun applications, location scouting, or even using the Pocket Cinema Camera as a director's viewfinder on set. At the heart of the rig is the retroFlex Cage, which provides added protection, stability, and accessory mounting threads for your Blackmagic Pocket Cinema Camera, while leaving access open to all camera functions. The camera attaches to the cage via a top and bottom 1/4"-20 threaded screw and rests flush against the backplate to assure the camera remains straight in the cage. The cage adds nine additional accessory mounting points, consisting of six 1/4"-20 threads, two 3/8"-16 threads, and a cold shoe mount. The retroFlex cage also provides points of attachment for the 3 x optical viewfinder and pistol grip. The optical viewfinder is attached to the retroFlex Cage for Blackmagic Pocket Camera via rare-earth magnets and an integrated mounting frame that prevents light leakage. It has an integrated adjustable dioptre for eyesight correction. The pistol grip support allows for the camera to be triggered at a moment's notice without needing to readjust your grip.